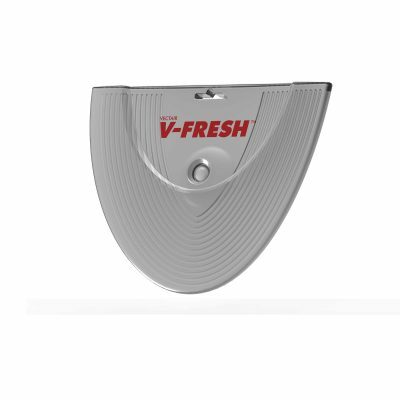 V-Fresh™ is a solid state universal air freshener that can be easily installed onto any hard surface using the suction cup provided. V-Fresh™ is aerosol, battery and propellant free. V-Fresh™ is part of the 'Harmonize Your World' range of passive aircare products - avoiding the fragrance clash in washrooms & other interior areas. Freshens areas with subtle scent delivery to help improve surroundings. Universal & multi-purpose. Fixes to a wide variety of hard, smooth surfaces via a small suction cup. Simple to install & replace. Aerosol, battery and propellant free. Dimensions | 100mm (h) x 77mm (w). Case size | 12 per case. Fragrances | 2 (Apple Orchard x Citrus Mango).